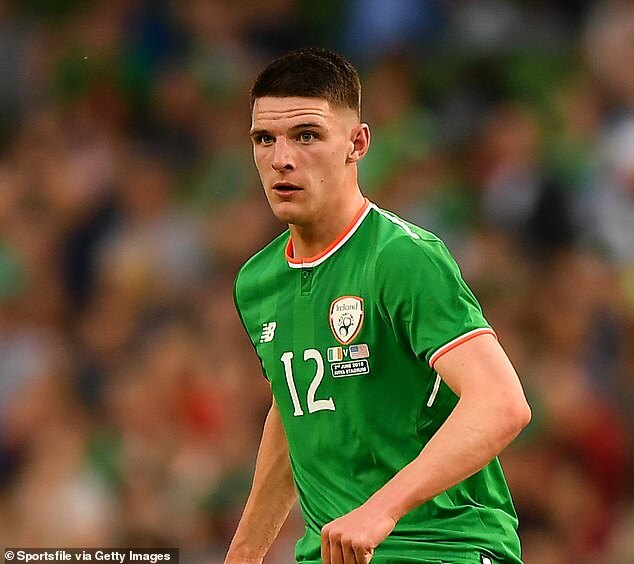 West Ham player Declan Rice has pledged his international allegiance to England over the Republic of Ireland. The 20-year-old midfielder said he had telephoned both Ireland manager Mick McCarthy and England boss Gareth Southgate to inform them of his decision and will submit a formal request to FIFA to transfer his international registration. Rice has played three times for Ireland but because these matches against Turkey, France and the United States last year were all friendlies, the London-born player was still able to make the switch to England. Under FIFA reagulations, a player is only committed to a nation once they have represented them in a competitive fixture. 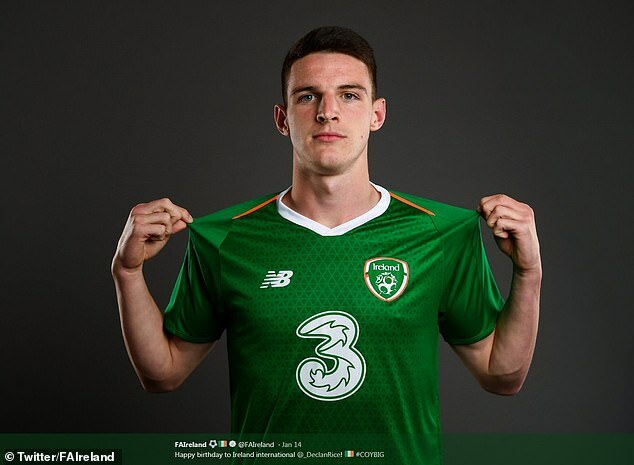 Rice, who has Irish family heritage, had previously represented Ireland at U16, U17, U19 and U21 level before making his senior debut under then-manager Martin O’Neill in March 2018. In a statement, Rice said: ‘This afternoon I telephoned both Mick McCarthy and Gareth Southgate to inform them of my decision to submit a written request to FIFA for the transfer of my international registration from the Republic of Ireland to England. ‘This has been an extremely difficult decision and, in all honesty, not one I ever expected to be making at this stage of my career. ‘In recent weeks and months, I have discussed the situation with the people who mean the most to me. My parents, my family, my girlfriend and my closest friends. ‘I have also spoken to Martin O’Neill and Mick McCarthy, Gareth Southgate and to friends and colleagues within the game whose opinion I respect. ‘I am truly grateful for the support I have received in leading to this decision. ‘Like so many people around the world, I consider myself to be of mixed nationality. I am a proud Englishman, having been born and raised in London. ‘However, I am just as proud of my family’s Irish heritage and my affinity and connection with the country. ‘I have equal respect and love for both England and Ireland and therefore the national team I choose to represent is not a clear-cut, simple selection. Particularly not for a young lad who never dreamed of being in this position. ‘Ultimately, it is a personal decision that I have made with my heart and my head, based on what I believe is best for my future. ‘I fully accept that some Irish supporters will be disappointed by my decision, and that everyone has different opinions in regard to the rules around international representation. ‘However, I hope that people can understand that I have made this decision with honesty, integrity and the full support of my family. ‘I would like to thank Mick McCarthy, Martin O’Neill, all of the coaching staff and everyone associated with the FA of Ireland (with special thanks to Mark O’Toole), not only for their support and understanding throughout this period, but for the part they have played in my development as a young player. ‘My pride at wearing the Irish shirt was always 100% genuine. It was a great honour for myself and my family, and something I will always cherish. ‘I would also like to make it clear that, in requesting to transfer my national team representation, I am not taking for granted a call-up to the England squad or making any assumptions about my future international career. ‘However, out of respect for the Republic of Ireland, I felt it was right to announce this decision now and put an end to the speculation. ‘I am still only 20 years old and there is a long road ahead of me. For now, my focus remains entirely on establishing myself as a Premier League player with West Ham United and working as hard as possible to improve and be successful. It came after the official FAI Twitter account wished Rice a happy 20th birthday last month accompanied by a picture of him in a green Ireland jersey.